Does your SaaS product have a wide variety of features and benefits, each appealing to a different type of user or audience? In this case study, we’ll discover how Rocketbots.io is growing their email list by targeting those different visitors’ interests using OptinMonster. Rocketbots.io is an AI platform that enables companies to manage, respond to and automate conversations across live chat or messaging apps. Robert Rafferty, Head of Growth at Rocketbots talked with us about how they’re using OptinMonster to segment and grow their email list. Rocketbots is fairly new to OptinMonster but is already using it in a creative way: researching their prospects’ interests in specific features and solutions. 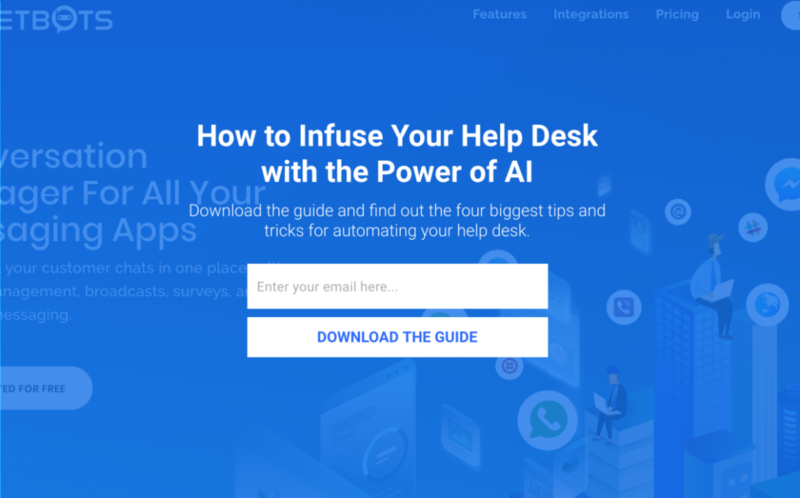 They started by adding a full-screen campaign to every page of the site offering a general guide on how artificial intelligence can benefit businesses. The campaign is triggered using our exit-intent sensor which displays the campaign only when the visitors’ mouse motions towards the browser bar. That’s a sure indication they’re about to leave the site. This campaign converts 2.65% of abandoning visitors. However, on some pages, the campaign converts as high as 33%. Being able to see which pages on their site generate more engagement with each offer helps Rocketbots more effectively target offers on those pages. 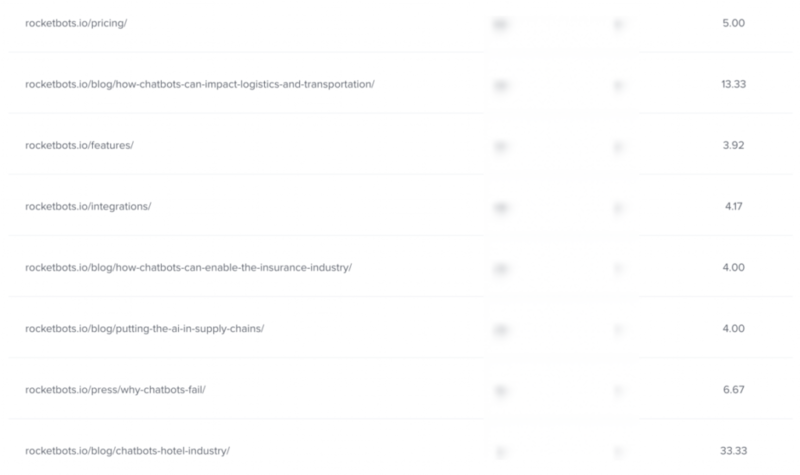 For example, on the page describing the integration between Rocketsbots and DialogFlow, they created a lead magnet and campaign specific to that integration. This campaign converts 7.33% of visitors who see it. Unlike subscribers to the general campaign above, these are segmented subscribers. And, according to MailChimp, emails sent to segmented subscribers perform 100.95% better than non-segmented emails. 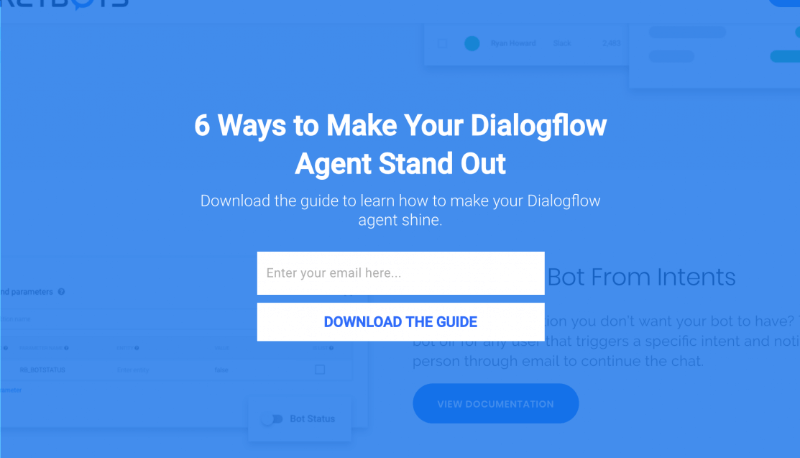 Knowing that this 7.33 % of visitors are interested specifically in their DialogFlow integration, Rocketbots can build out entire email marketing campaigns specific to their needs. This type of onsite targeting has helped Rocketbots dramatically increase their email list. Prior to using OptinMonster, they were using Hubspot’s optin forms to collect subscribers with poor results. Since switching to OptinMonster, they’ve increased the size of their list 680%! And they’re not the only ones making waves. Check out how Podcast Insights grew conversions 1099% with onsite retargeting. Create the ‘perfect’ lead magnet campaign then use OptinMonster’s “duplicate campaign” feature to create new campaigns like it later. Once you’ve found your company’s style, it will save you a bunch of time! Interested in learning more about how you can segment your list? Here are 50 smart ways to segment your email list. Rocketbots.io uses OptinMonster to research their visitor’s interests and then creates more targeted campaigns in response. Rocketbots converted 7.33% of targeted abandoning visitors. Rocketbots added 2.65% of sitewide visitors to their email list. Rocketbots saw a 680% increase in list growth. When your product has a wide range of features, use OptinMonster to offer lead magnets and offers specific to the audiences those features benefit. At Rocketbots, OptinMonster has been a great help at increasing our list 680% and growing.